Recently I watched a fairly educative program on TLC upon bizarre food habits of people around the world. I came to know of a particular dish which involves eating fishes alive called Fish Ikizukuri. It requires high level of skill to fillet the fish and serve it on a plate with its sliced flesh on top decorating it, while its heart is still ticking. I watched a couple of videos on Ikizukuri and must I say, I find it a cruel practice to enjoy eating something that is still fighting for its life. Completely bizarre and inhuman indeed. 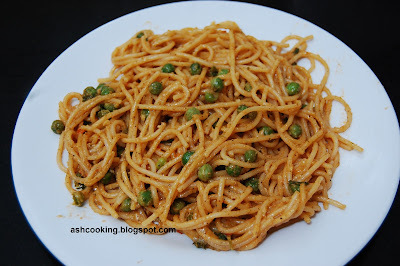 Back to my recipe, there was a time when I was unable to tell spaghetti and noodles apart, because when cooked and served garnished on a platter, they look quite identical and I was not used to eating pasta for pasta was not so widely available in our country before open market was implemented. Note: Chilli garlic sauce is easily available in the market. In case of its unavailability prepare it at home by following the link highlighted above. 1) Boil the spaghetti till they become tender. Drain and keep aside. 2) Heat oil in a non-stick pan. When oil turns hot, add the peas and roast them for 2 minutes. 3) Add the parsley leaves. Stir and add chilli garlic sauce and milk. Stir around for 1 minute and add the pasta. 4) Sprinkle salt, paprika and pepper powder. Stir around. 5) Add the grated parmesan cheese. Stir in and cook on medium heat for 1 minute more. Serve hot.